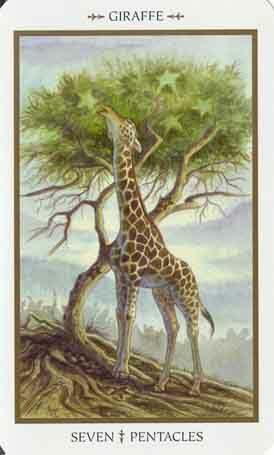 Symbols*: The giraffe extends its neck to retrieve the greenery on top branches of a tree. Its hooves remain firmly planted on the ground as it engages in this task. The giraffe represents the capacity to extend beyond the limitations of the physical plane. It has the unique ability to access material that resides on higher planes of consciousness. Its ability to obtain sustenance flourishing on a seemingly unattainable perch symbolizes the necessity to overcome limitations and to allow innovative ideas to flourish. Description*: If we fear extending ourselves beyond our comfort zones, we have the potential to stagnate and wither under the weight of self-imposed limitations. Once we have established groundwork for our endeavours, it is a good idea to visualize the next step. This is the time to think outside the arena of expectation and to push the boundaries of your own imaginative work. It is important not to place your security in a compromising situation, but rather investigate ways you can invest yourself with minimal risk until you feel comfortable enough to stretch yourself further. Possible Meaning: This the time to think outside of the box to make new discoveries and innovations. Push the boundaries of self-imposed limitations; you can do a lot more than you might think. Thoughts/Points to Ponder: The giraffe’s neck is the bridge between the realms, farsightedness to see beyond, expression and communication through body language, family ties. He is a teacher of balance of sky and earth, as well as care in what you say and how you take others opinions.